Soundscapes was created with one main focus; to design and install smart but simple Audio/Video systems to satisfy the needs of our diverse client base. The name may be new to some but the pedigree is decades in the making. Times change, as do administrations, economics and technology. One thing that has not changed is our passion for what we do. We pride ourselves in taking a practical approach when designing a project as if it were in our own home or business. Nothing is future proof but we educate ourselves and our clients with the best solutions and systems that are simple and allow them to grow as their needs expand. I can honestly say, I love what I do. Honestly, I play with toys for a living. Personally and professionally I have always been one to thrive on accomplishment. I enjoy designing a system, installing it, and seeing it come to fruition. I started working in Mobile Audio and quickly migrated to Home Audio for a national retailer. I found a need to help our clients with the installation of their systems. Recognizing a need for these services, I formed an installation company with the help of my current business partner, Jared Conrad. I sold the company to that national retailer who I then went to work for as the director of custom installations. I created the installation division of New England for them with 26 crews working out of 8 offices in 6 states. I learned a lot and enjoyed the challenges and experiences of working for a large national chain but I missed the simplicity and rewards of working with clients one on one. I now own and operate Soundscapes using all of the skills that I have learned from the past 23 years in this industry. I started working in this industry 20 years ago, back when things were much simpler. I began as an apprentice for Paul Staz, my current business partner, installing components sold by a national retail electronics store. Following that, I went to work for that company as the Installation Manager for RI, MA, Cape Cod and the Islands. After helping to grow the business, I was moved into the Field supervisor position for 4 prominent stores where I consistently held the top sales/install numbers in the region. I now own and operate Soundscapes and have for the last 7 years. What I like most about what I do is I am able to transform an empty space into one that incorporates modern technologies that seem as if they were always meant to be there. I have always enjoyed making something from a pile of parts, starting with a vision and seeing it to reality. I pride myself as one that cares as much about the aesthetics as I do the acoustics. Your home is your castle, I understand that. 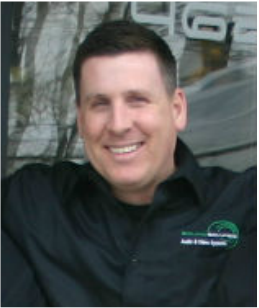 With over 20 years in custom Audio Video installations going back to his days as the Custom Installation Manager for Tweeter in Hanover, MA. Rich has developed some serious skills in the arts of "making it happen". He is great with people and even better with animals! Rich is also multi talented! When he's not cutting a pair of speakers in a rosewood ceiling, he makes chainsaw carvings for fun!! Paul is our programmer. AKA- The guy that makes the magic happen! He's about as passionate as they come when it comes to tech. He's started out as a customer of ours who decided to build his own system from scratch. Including all the programming. When a position opened up, we gave him a call. The rest is history!